Sassy and Brassy! 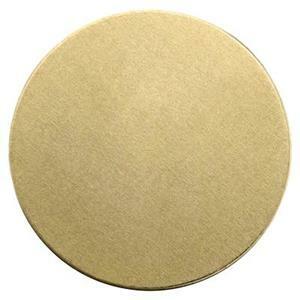 Our 39mm 24 Gauge Brass Circle Blank. (No Hole). A Great Little Piece that will have an Even Greater Impact on your Jewelry Designs! 24 Gauge is too thin to absorb a good Stamping Impression, but you can Rivet, Enamel, or, Engrave it. Or, since Brass has a Naturally Gorgeous Glow to it – add to that Radiance by using our 9-Face Texturing Hammer stock number X470 or our 12-Face Texturing / Forming Hammer stock number X471.